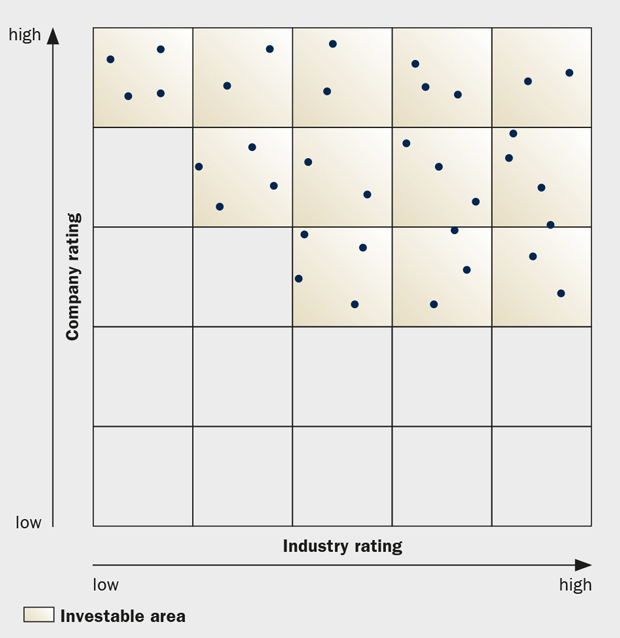 The Industry Analysis identifies long-term investment drivers, which differ between industries. It focuses on understanding how industry structure and demand or supply dynamics drive competitiveness, assessing the industry’s drivers of profitability and identifying the key industry metrics. These include sustainability mega trends such as climate change or demographical change. Among the ESG key issues of each industry, we identify those that are potentially financially material. The third step of the investment process, the Sustainable Investment Analysis, draws on the fundamental understanding of the industry which Bank J. Safra Sarasin acquires in the first step “Industry Analysis”. In this step, Bank J. Safra Sarasin identifies the industry- specific financially material sustainability aspects which the Bank integrates into its investment analysis. It uses both qualitative and quantitative tools. The Portfolio Construction process relies on a quantitative multifactor risk model to construct portfolios and to control external risks.